Earlier today we published a (very long) story that provided a detailed insider’s view of the Ricketts family’s 2009 purchase of the Chicago Cubs. Included in that story are a bunch of emails revealing that a significant amount of intra-family squabbling took place during the sale process. In the interest of serving readers who are more interested in learning about the inner workings of one of the richest families in America than they are in learning about debt financing, those emails have been excerpted here. 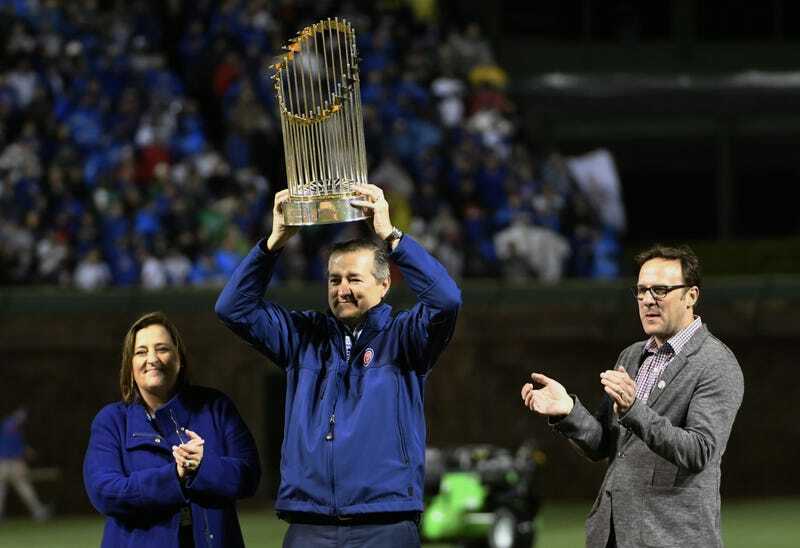 The emails, which are laid out in chronological order below, show that there was growing tension between Tom Ricketts, who led the negotiations to purchase the Cubs, and his siblings Laura and Todd, who believed that Tom was getting too much of the media spotlight throughout the throughout the sale process. Their other brother, Pete, and father, Joe, occasionally tried to play peacemaker. I have scheduled 2 hours for our call this Friday. Also, as I do not have a background in finance, it would be helpful for me to visit with Tom afterward to be sure I fully understand. Regarding the media coverage, judging from the articles I have seen in the WSJ and Tribune, their reports may mostly be based on who actually signed the bid letters, as opposed to Tom’s request to the Tribune business editor. So, we may still have to watch how we are portrayed in the Tribune at least. Also, their reports now make it seem like it is Tom bidding as an individual as opposed to the family, which is still inaccurate. But, at least for now, we seem to have gotten rid of the Omaha designation. This is relevant to the issue I raised during our private family conference call on Friday. Now that this process is underway and receiving more media coverage, obviously we are going to have to pay more attention to how we manage the media. We should all be informed and have input on how the media is being managed. The media coverage is also part of the broader issue of the impact the acquisition of the Cubs would have on our lives, particularly those of us living here in Chicago, which we have not yet discussed to date. I did flag the new inaccuracy to Dennis and Scott and we will look to clean it up. We got the ‘Omaha’ out but need the ‘family’ in. I don’t know when that will be because we told everyone to that we were not interested in being in any more media. On the other hand, if you prefer a lower profile, this is not the worst outcome. I don’t believe that the writers saw the bids. We submitted very late in the day for a leak to make the deadline and the articles don’t mention the other people we know to be bidders. I think the Trib thought they were doing what I asked them do and the WSJ implied family money through the “son of” language. Also keep in mind that newspapers always look to use the fewest number of words to make their point. On other PR fronts away from the Trib and WSJ, I referred four or five other calls directly to Res Publica (Sun Times sportswriter, Reuters, AP, Channel 7). None of these amounted to anything. After the call yesterday, I decided not have a written statement to send out because the statement would be quoted by everyone and we are trying to avoid any quotes. It is also not clear what the NDA would say about a statement. I have spoken to writers at Crains, Bloomberg, and will meet the guy covering this at the NYT. The logic of talking to the writers is to tell them that we intend to respect the NDA but want them to be accurate about the family and to have an established dialogue if/when we ever need to talk to them. Overall, we are being very proactive on the media front and I think we are fairly well positioned. I am happy to give more detailed updates if anything comes up. On the bigger picture on how it will effect our lives, I agree we should all be thinking about these issues. If anyone has any suggestions on what we should be doing, let’s have a discussion. This Crain’s article is a positive and very flattering piece about you. But, to be quite honest, it makes me irritated and disappointed, particularly in light of the discussion we had during our family conference call last Monday. I realize that we cannot control the media. But in this instance you provided input at least in as far as you steered the reporter in a certain direction. I find it irritating, and it makes me feel either unheard or just disregarded. I suggest that we, as a family, talk further about this and the media generally. What is the schedule and agenda for tomorrow’s meetings? Will we have time for the five of us to have a private meeting aside from all the lawyers and bankers? I’m really pleased that you express your thoughts and feelings freely. I’ve been thinking for a while that feelings such as you express may be prevalent among the other family members but were just kept suppressed. The thought was a quandary for me. This is a family enterprise and activity and so anything that would not pull the family together should be avoided and/or eliminated. This is why I suggested that WE put out a Press Release indicating that this effort is a family effort and that we designated Tom as project leader. However, it appeared to me that you folks didn’t seem to positive toward the approach so I let Tom continue to take the lead. There isn’t any doubt in my mind that if any of us are irritated, feel unheard or disregarded then we should not buy the Cubs. We should take some time to be by ourselves tomorrow as we need top make this effort a positive and not a negative event. We certainly can discuss this tomorrow. I am open to any suggestions on how to engage with the media. I would suggest we include Dennis so that none of you think I ignored the suggestions from the last family call on the topic. In the end, every single bidder in this process represents a group and the media are going to focus on the lead person in the group. I am not sure what can be done about that. Overall, I think we have handled the media extremely well. We have avoided receiving media attention and what little media we have received has been positive, if not evenly distributed. We are not now and have never asked a reporter to write a story on us (or me) and I don’t think that we should change our policy. We have received high marks from the league for this strategy. In the end, the only people that matter right now are at MLB and they know it is a family bid. I appreciate your point about MLB’s perception of us, but I would argue that, in the end, the only people that matter are our family members. This is not just an issue of what we need to do to impress the MLB, but also what we need to do to be respectful to everyone in the family. Also, I think this media issue is actually part of a bigger issue that deals more with our family dynamic. As such, I suggest that we have a discussion with just the family. If you’d like we could include Dennis for part of that discussion but I don’t really think he will provide any insight in to what is at the core of this issue. FYI, ESPN TV just did a whole segment on Tom buying the Cubs. They even interviewed a Tribune reporter who also referred to Tom as the purchaser. I appreciate the concern to make sure the PR stays on message but I would also like to remind you that, based upon my experience for 14 months during my campaign and all my time at AMTD , the press says any damn thing they feel like if it will get them audience. Do you think someone should ask Larry and Curt and any others not to speak to the media? I spoke with Larry this morning and he said a reporter contacted him through facebook asking for a quote but he declined. OMG. Just saw Tribune front page at the Newseum in DC. The heading is “Meet the Cubs’ $900 Million Man” with a big photo of Tom next to it. Which is disappointing. I definitely think we should request that various friends, specifically Larry and Curt, not speak to the press for now. We missed you at this morning’s call and I think it would have been helpful if you had been there. Tom updated us on the current discussions on the finance side which he can give to you later, but more importantly we had a discussion about the PR and media. Laura and I, again, expressed our concern about the public perception on the deal. I expressed my thought that it is crucially important that we try to keep the press clear on what the new ownership of the Cubs will look like. My reasoning for this is that my kids live in the same neighborhood and go to the same school as Tom’s kids and I don’t want them to have to constantly explaining that there are equal owners when they are told that their uncle owns the Cubs. The reason I am sensitive to this is that even today I feel as though my input and ideas are disregarded among our family just as they were when we were kids. This is not the feeling I ever want my kids to have and because they are the beneficiaries of the education trust that is proposed to finance the deal I take it very seriously. To that end, I suggested that Laura and I start working more closely with Res Publica on formulating our PR and also suggested that this may be a good way for others of us to start becoming more involved in the process while at the same time alleviating some of the many tasks Tom is trying to address at the moment. I have to say, I was shocked and disappointed with aggressive, hostile tone in which Tom responded. In fact, I would call it an “uninvitation” to be part of this process. I guess what really became clear to me is that this deal is not about having a shared asset that we can work together or something that will bring our kids closer together. And because of that I am more skeptical than ever as to whether this is a good idea for our family and/or a good use of trust investment dollars. It’s hard to say where the conversation went from there. Whatever offline discussions between the family may have occurred did lead to one conclusion, though: The family needed a new public relations firm. A few days later Joe sent an email to Alfred Levitt, the president and general counsel of Joe’s holding company, saying that he was “not satisfied with Res Publica” and would like to find a new PR firm once the deal for the Cubs was closed.